SG FNPO D.Kishan Rao appeal to all All General Secretaries FNPO affiliated unions, Office Bearers.All Circle/Divisional and Branch Secretaries of FNPO affiliated unions. Organise the 31st May &1st June 2018 programmes with the largest participation of employees. 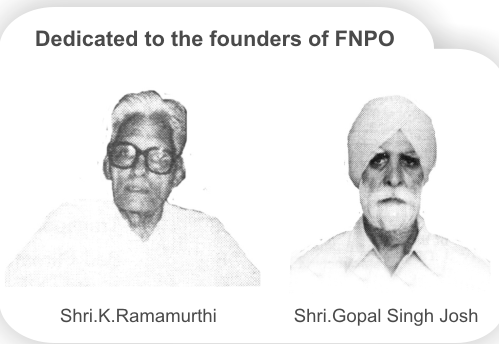 All Circle/Divisional and Branch Secretaries of FNPO affiliated unions. You are aware that the entire GDS employees of the Department of Post are on Indefinite Strike from 22.05.2018. BPEF-GDS Union is also on strike from 14.05.2018. The AIGDSU and NUGDS gave notice for indefinite strike from 22-05-2018 subsequently AIPEU-GDS (NFPE) also served indefinite strike notice from the same date, i.e. 22-05-2018. Now 9 days are over the strike percentage according to Department 90 to 95%, in fact, the strike is total as on date. Circles like Kerala, A.P, Telangana West Bengal& Tamilnadu departmental employees’ Unions also joined the strike from 22-05-2018 expect Kerala other circles withdrawn the solidarity strike. In Kerala departmental employees of FNPO and NFPE are continuing their strike till date. Entire states across the country the GDS Percentage increasing day by day today it is almost total. As on date five rounds of discussions held with Secretary, Department of Posts, Additional Director General, Posts and conciliation meetings with the Regional Labour Commissioner. The Department is not ready to give any written agreement to the GDS unions. 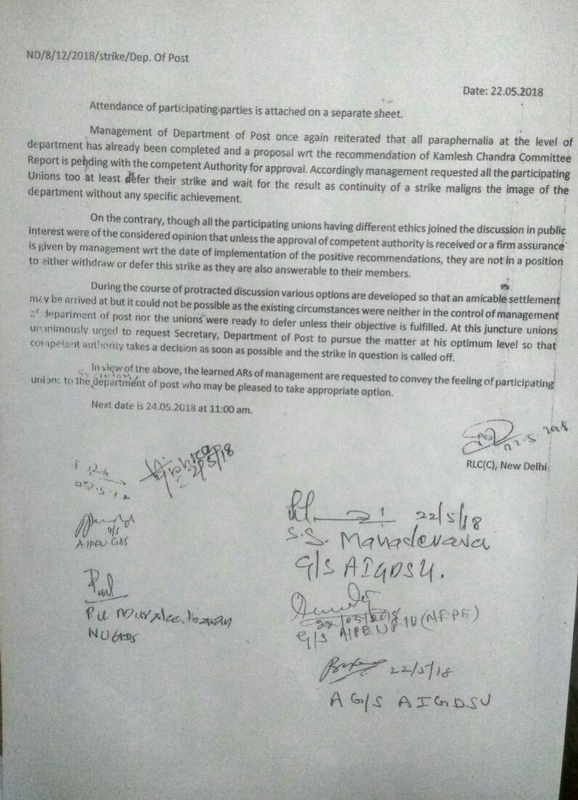 PJCA meeting was held on 16/052018 and a letter was sent to The Chairman, Postal Services Board demanding early implementation of Kamalashchandra positive recommendations yesterday NFPE & confederation jointly issued a call for a mass hunger fast in front of major Post office/RMS offices on 31st May 2018 Thursday from 10 AM to 5 PM.& March to Sanchar Bhawan on 01/06/2018. Viewing the above FNPO and its affiliated unions decided to conduct Lunch hour demonstration in front of all Postoffices/ RMS offices on 31/05/2018. It is also decided to participate in the Sanchar Bhawan March as already announced by the striking GDS Unions on 1st June 2018 Friday at 10:30 AM. All Circle/Divisional and Branch Secretaries of FNPO affiliated unions. Organise the above programmes with the largest participation of employees. Sri Tilak Dey, Additional DG Post's, Smt Smruthi Saran, Director ( Estt). The outcome of the meeting is published below. Tomorrow again one meeting with Regional Labour Commissioner at 12 AM. The FNPO & affliated unions totally support the GDS indefinite Strike from 22 May 2018. 1. Arranging picketing’s at HO’s and bigger offices & Divisional offices specially in CO & RO’s. 2. Do not go against the GDS employees Indefinite Strike. 3. Don’t allow departmental employees to interfere with the duties of GDS employees. 4. Don’t allow any transactions with out RICT & don’t allow any officiating arrangements. We should see that this strike is total success and no departmental employee should obstruct the strike according to the GDS employees demand. We should act for the success of strike . The PJCA is observing the situation and it will embark on a total strike according to the situation. We appeal to the Postal Board and Ministry of Communications to take appropriate decision soon. The PJCA already made this intension to join the strike and many Circles joining the strike from tomorrow which is a spontaneous action. 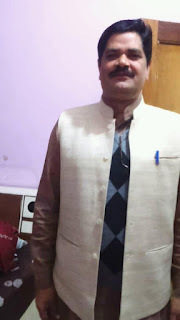 The Postal Joint Council of Action is not responsible for the stalling of postal operations and the responsibility rest with the Ministry of Communications and the Government of India.